Many Americans nowadays care about making eco-friendly choices. And when it comes to countertops, engineered stone is one of the most environmentally sensitive choices you can make. But this type of surface offers a host of other benefits, too. It’s durable, beautiful, hygienic and easy to care for. We asked Princeton, NJ-based architect Joshua Zinder for his take on this versatile surface. Read on for his insight. What kind of engineered stone can be used as a countertop? 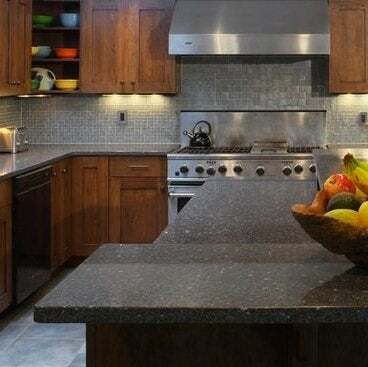 Most engineered stones are fantastic for high-wear uses such as kitchen countertops. There are a variety of products on the market, including Silestone, Caesarstone, IceStone and many more. The products should be acid-resistant and non-absorptive. The size and types of materials used to make the engineered stone will determine its best uses. For example, an engineered surface with large chunks of marble will be limited in performance to the pieces of marble it contains. What makes engineered stone good as a countertop surface? Unlike solid surfacing or plastic laminate, which are temperature-sensitive and can catch fire, engineered stone resists heat well. And unlike some other surfaces—even natural stones—engineered ones resist stains from liquids like wine or coffee. What are its primary characteristics? Strong, durable, and attractive, engineered stone is very consistent in look and pattern. It is also heat-resistant and does not accumulate bacteria or mold. The surfaces are easy to maintain, too. They can be specified with bacteria-resistant surfaces, but since they are non-absorptive and resistant to heat anyway, they should not be collecting bacteria in the first place. Pros include brute strength and heat resistance, as well as varied colors and styles. Some engineered stone products are made to look like limestone or marble, enabling you to get the look you want but with better performance. If you like using recycled materials or protecting natural resources like real marble, engineered stone counters will do the trick. The products may have natural colors or added colors with various textures. Many contractors are familiar with the products and will install them properly. It’s hard to create curves with engineered stone, but as far as typical countertop designs go, there’s nothing you can’t do with these products that you can accomplish with conventional stone. In fact, we’ve pushed the limits with edge and corner details and other shapes in engineered stone materials. Generally about $60-$100/square foot installed. With engineered stone, you pay for good performance and a long lifetime. Some colors and patterns are more expensive than others. But some can be quite affordable (I even put one of these in my own house). So it’s expensive but no more so than many natural stone slabs and solid surface materials. It’s definitely more expensive than plastic laminates. But consider this: For years we were specifying white marble with no veins, which looks great but is very expensive. Now to get that white look, we can use engineered stones, which look exactly the same as marble side by side but don’t cost as much. There are lots of suppliers, and the product delivers a consistent look. What are its installation requirements? Work with people who know the material, and look for those who are recommended or certified by the material manufacturers. To see architect Joshua Zinder’s work, click here.